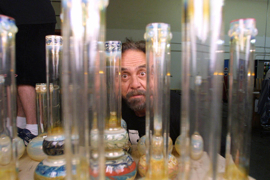 The DVD distributor is getting final clearances for some of the rare video clips that are in the a/k/a Tommy Chong documentary (there are tons of rare clips). As a result, the distributor will not be shipping the DVDs until, at the earliest, late next week. Due to overwhelming demand, we had to temporarily stop taking orders for a/k/a Tommy Chong. We are happy to say we WILL have enough DVDs and the DVD WILL still be released on March 3rd. The pre-release DVD date for Tommy's loyal fans is March 3, 2008. The national release date is April 20, 2008 (4/20). Cheech Marin will take part in a panel discussion at 4 p.m. March 7 at the El Paso Museum of Art. The panel discussion is a part of a Regional Arts Training Workshop March 7-8. The workshop is free for NALAC members and $10 for non members. For a full scope of the sessions and more information please visit www.nalac.org or call MCAD at (915) 541-4481. Fruits to Remember of Beverly Hills was invited to be a part of the pre-Oscars gifting lounge organized by WOW creations. The two-day event on February 19th and 20th held on the penthouse floor of Hyatt on Sunset received scores of A-list celebrities including Marco Beltrami (Oscar Nominee for the best original score, Oscars 2008), William Shatner (Star Trek, Boston Legal, …), Mimi Rogers (The Golden Door, The Chaos Theory, The Loop, …), Shaun Toub (Iron Man, The Kite Runner, Crash, …), Cheech Marin (Planet Terror, Grindhouse, Judging Amy,…), Tia Mowery (The Game, Hollywood Horror, Girl Friends,…), Omarosa (Apprentice, Queer Edge,…), Tyler James Williams (Everybody Hates Chris, Unaccompanied Minors,…), Kyle Massey (Cory in the house, That's so raven, ..) among others. The event received such a warm reception that had to be extended on Wednesday for an extra hour. The lounge was also visited by a good number of members of the press including members of Associated Press, LA Times and Infolist.com among others. Someone posted this video of Traveling Wilbury's Wilbury Twist on youtube. This music video, from 1991, features Cheech Marin, John Candy and other celebs. Eric Tremblay posted this animation he created for the Cheech and Chong bit Dave's Not Here. He did an awesome job so we figured we'd post it. 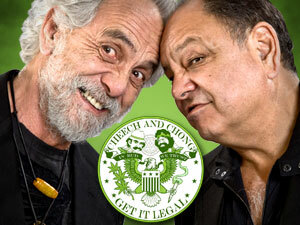 Tommy and Shelby Chong will be at the Improv in Ontario this weekend. 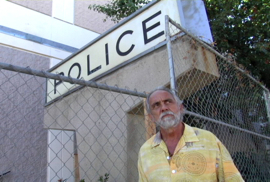 The Press-Enterprise asked Tommy about a possible Cheech and Chong reunion. "He wants to get back together," Chong said. "But I told him, 'Only if it's my way,' you know? And he doesn't like that." Hip-Hop producer Jazze Pha and executive Kenny Burns have teamed with TNT Networks to remake the song "Basketball Jones," originally recorded by comedians Cheech & Chong. The single will be introduced during NBA’s All-Star weekend in New Orleans. It will also be featured in Tyler Perry’s show House of Payne. The stay of Cheech Marin's "Papel Chicano" exhibit at The Muzeo in Anaheim, California may be extended. "There has been discussion of extending the exhibit's stay since we have received such a great response from the community ... but no final decisions have been made," Executive Director Peter Comiskey said at Muzeo. The exhibit currently runs until May 5th. We have a super cool new Cheech & Chong t-shirt in stock. 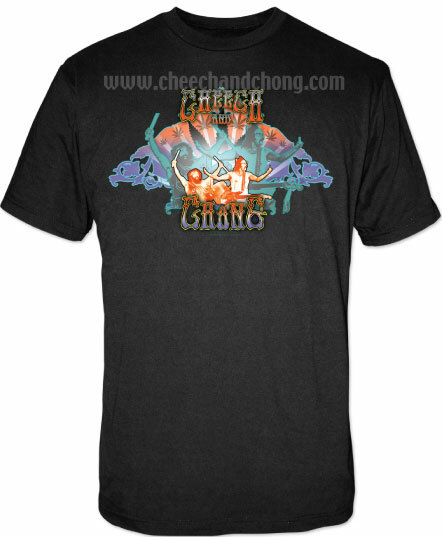 The Concert T features an image of Cheech & Chong performing Earache My Eye from the film Up In Smoke. We now also have the best-selling Cheech & Chong Sand Ringer t-shirt in size small. Mike and the Mechanics covered the Beatles' song Revolution for the Rude Awakening soundtrack. This 1989 film starred Eric Roberts, Cheech Marin, Robert Carradine and Rae Dawn Chong (Tommy's daughter) . Unfortunately, this HBO film has long been out-of-print. This weekend, Tommy Chong and his wife/comedy partner, Shelby, are bringing their hysterical show to the Jukebox Comedy Club in Peoria, Illinois. Journal Star Online interviewed Tommy via phone while on vacation in Aspen. Regarding the reunion, Tommy said "never say never" and that he's still "in touch" with Cheech's people. Tommy Chong gave some advice for Britney Spears to Associated Press. "Enjoy the attention because it's not going to last," he said. "The serious advice is someone needs to check out her diet, and if cocaine is part of the diet then cut down, eliminate cocaine from the diet." Yesterday, at the "Evening of Hope" fundraiser, Los Angeles Mayor Antonio R. Villaraigosa presented an award to artists who have contributed to community empowerment. Honorees included: Antonio Aguilar (posthumously-award accepted by Pepe Aguilar), Cheech Marin, Sinbad, Talaya Trigueros (KTWV The Wave Radio Personality), Felli Fel (KPWR Power 106 Radio personality), and Harold Owens (Grammy Foundation).